Who doesn’t love Matzo Ball Soup? Certainly not my little man. In celebration of the Passover holiday, I made mini matzo ball soup. My version couldn’t be simpler. The broth is made from chicken stock, to which I added carrots and celery and a few dill fronds. 1. Mix all matzo ball ingredients in a medium-size bowl. Cover and place in the refrigerator for 30 minutes. 2. Bring 3 quarts of salted water to a boil (don’t be shy with the salt). 3. Meanwhile, with wet hands form matzo balls scooping a 1/2-inch ball of batter between the palms of your hands and rolling them loosely into balls. Drop them into the simmering water one at a time. Cover the pot and cook for 30 to 40 minutes. 4. Bring chicken stock with carrots and celery to a simmer. 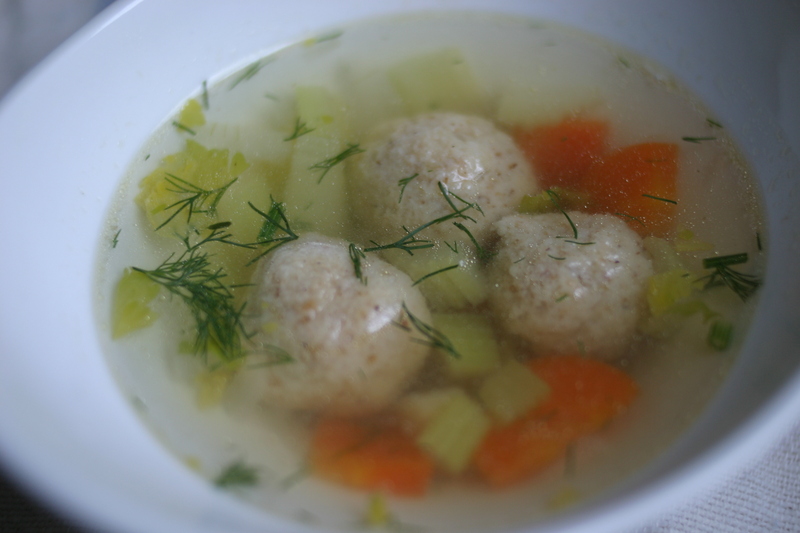 Ladle soup and matzo balls into each bowl and top with chopped dill fronds. Enjoy! Tru Drew! He’s not read about the 144 horsemen in Revelations! @ezrazoe: Let me know if EZ gives the recipe thumbs up or thumbs down!